This was a bit of a monster, in that it took me so long to get through it.And while Haruki Murakami is pretty much a total genius, this one was a little bit of a slog. The plot is his usual brilliance – two young Japanese people are drawn into a parallel world where the “Little People” create many “Air Chrysalis” for some strange agenda. Chapters are told alternatively from each of the perspectives of Tengo, a young mathematician and aspiring writer who agrees to ghost write a disjointed but fascinating novel detailing the work of the “Little People” mentioned above, and Aomame, a personal trainer and assassin who went to school with Tengo and was drawn to him as a fellow outsider. While nothing more than a brief clasp of each other’s hand occurs in school, they remember each other as adults and secretly yearn to see the other again. But it is only in the parallel world, a different form of the 1984 the novel is set in (which Aomame dubs ‘IQ84’) to bring them together. Realising their need to find each other and discover a way out takes up much of the novel – although there are long periods whereby Murakami could have sped this process up which frustrated me a little. But this is simply not his style. he takes his time, exploring all recesses of his characters minds, and even demonstrating them doing the minute day-t0-day activities he seems to love so so much. The mystery of what is going on will keep you going after a confusing start, and it is (as always) worth pursuing the narrative through to the end. Don’t expect any hard and fast answers – this isn’t Hollywood after all. Just enjoy the ride into a very strange but beautiful mind. An exquisite set of short stories from the always beautiful Haruki Murakami. 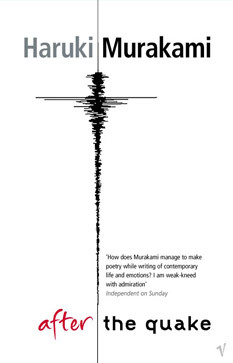 Each explores the aftermath of the earthquke in Kobe on a variety of characters, each of whom are somehow living a life that is left of centre. Their lives are disjointed from others. The unreal comes calling. So does strange understanding. Hard to explain unless you have read him yourself. This is my favourite collection of stories so far, culminating in the glorious ‘Honey Pie’, about a short story writer who can only be fashioned after Murakami himself, given what I have read about his writing process. Also notable are ‘Super Frog Saves Tokyo’ – who doesn’t love a bit of magical realism. ‘Landscape with Flatiron’ ends powerfully as well. Murakami is often at his best in his short stories, which loan themselves so beautifully to his thought-provokingly abrupt style. 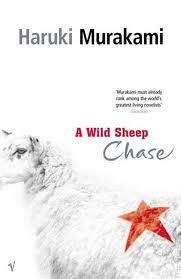 Haruki Murakami follows up the brilliant Wild Sheep Chase, with the satisfying Dance, Dance, Dance. The unnamed narrator of the last novel continues his adventures – and while the two stories do not follow directly on, the second makes enough references to the first to make it best to read Wild Sheep Chase first. The narrator returns to the newly remodelled Dolphin Hotel, where he believes he has been summoned by his girlfriend from the previous novel, a call girl we come to know as Kiki. Kiki, who possesses a pair of magical ears, has disappeared. He meets the sheep man again and a strange young girl – Yuki – who has been all but abandoned by her famous parents. The pair strike up a friendship, one of the two central relationships in the novel. The other is with an old school-friend, now a moderately successful actor, well suited to playing squeaky-clean matinee idol parts. On the screen at least. 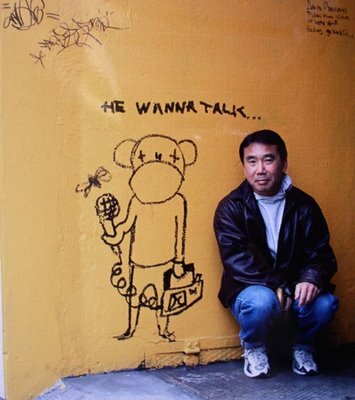 This hard to come by Murakami is in true vintage style. The characters all remain nameless, and are somehow caught up in a supernatural eddy that moves them from the ennui of their day to day lives. This is definitely our beloved favourite author at his best. Apparently Dance Dance Dance follows on from this, so I’ll be attacking that shortly. This collection of short stories demonstrates beautifully that magical quality of Murakami’s to blend the mundane with the sublime. Sleep – About a woman who no longer requires or desires sleep and how she spends her days. Barn Burning – A man is told a story about burning barns and just cannot forget it. Even when he figures out the man’s stories about burning barns recreationally are false, its like the thought takes on a power of its own. The Dancing Dwarf – A man dreams of a dwarf with the power to mesmerise others with his dancing, and makes a dangerous deal to win the heart of a beautiful woman. 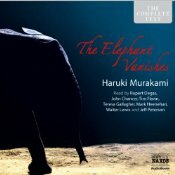 The Elephant Vanishes – A man is strangely moved by the disappearance of an elephant adopted by a local village. I like the pace and slow development of Murakami’s novels better, but nonetheless these are a wonderful opportunity to experience the breadth and variety of his mind at work. As usual a very strange but somehow poignant novel from Haruki Murakami. 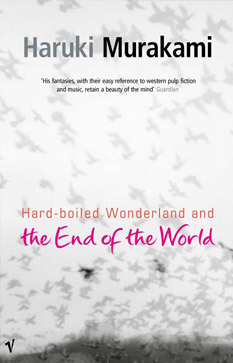 The narrative alternates with each chapter, and as we progress through the novel, we see the connection bewteen the two stories as alternating worlds belonging to the same narrator. The first storyline (arguably – according to characters in this world) is the “real” world, although one that is vastly different to our own. The narrator (no names are given at all) is a Calcutec, a man who has been trained through surgery and extensive mind work to use his subconscious to cypher and shuffle information. He is hired by a strange scientist and is caught up in the the race to steal the scientist’s data. The scientist gifts him a skull which is later revealed to be a unicorn skull, and seems to have some great value for those pursuing him. The even numbered chapters deal with a strange little village the narrator has just entered. To do so, he has been separated from his shadow, thus giving him a kind of amnesia/mindlessness displayed by the other characters in this world. He is given the job of ‘dreamreader’ and sent to the library to read skulls. There, he falls for the librarian, a young woman who is unable to love him back because of her own mindlessness. This leads the man to ponder the nature of the mind, and what the seemingly serene village is. This is combined with occasional pleas from his shadow to help him escape the and to rejoin with him. As the story continues, the narrator is drawn more and more strongly into the second world (the mindless village), apparently a construct of his own subconscious to allow him to survive the shuffling process that has killed so many of his contemporaries. In hs typical understated style, Murakami creates realistically odd worlds that remain a beautiful mystery even at the end of the novel. Not his best, but definitely worth a look. When in doubt, go for something you know. Thats my justification for reading this book at this time. My brain has been finding it really hard to read – I dont know whether it is that end of year mind-laziness that means it only wants to watch trashy TV and nothing more challenging than Gossip Girl will work, or whether it is simply a reaction to tackling the lond-winded and seemingly pointless The Story of Edgar Sawtelle, but either way my reading has been suffering. So, I sought refuge in Murakami, one of my favourites. 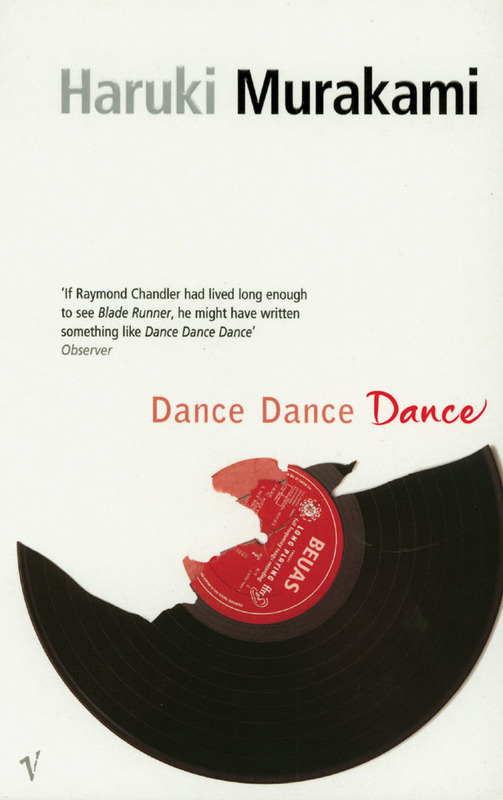 Plus this is a short novel, that would give that satisfaction of finishing all the sooner. Sputnik Sweetheart is another wonderful book. Our narrator is the nameless K. who loves the author in waiting, Sumire. However, Sumire – always unmoved by romance – finds herself in love with Miu, a beautiful, sophisticated woman 17 years her junior. But Miu has her own story, one that takes place in the dead of night on a Ferris Wheel (trust me, it will make your skin crawl in true mystic Murakami fashion). When Sumire disappears without a trace, K. travels to Greece and Miu to search for her and make sense of their strange bond. Well worth the read as usual. But I do not recommend Edgar Sawtelle, I gave up half way.